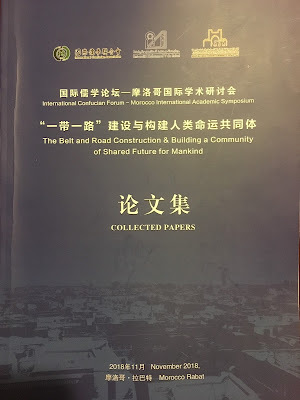 The past 13 to 17 November I attended in Rabat (Morocco) the "International Confucian Forum - Morocco International Academic Symposium: The Belt and Road Construction & Building a Community of Shared Future for Mankind". 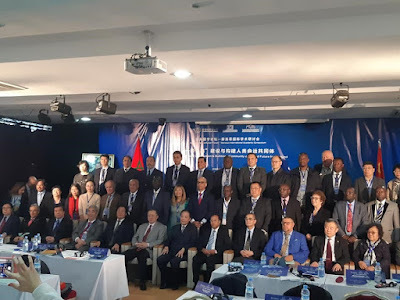 I was invited as member of the "International Cofucian Association"
The meeting was organized by the International Confucian Association; Mohammed V University in Rabat; Beijing International Foreign Studies University and the Faculty of Law, Economics and Social Sciences-Sale. 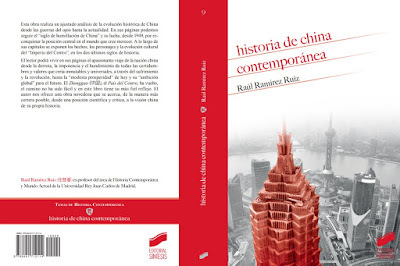 The organization was supported by the United Nations Alliance of Civilizations and the Confucius Institute in Rabat. 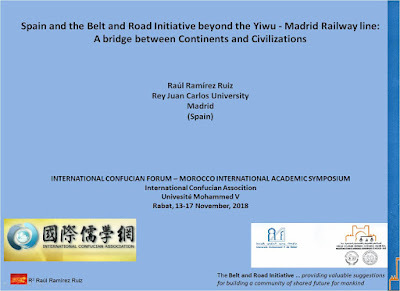 A meeting that has served to present the paper "Spain and the Belt and Road Initiative beyond the Yiwu - Madrid Railway line: A bridge between Continents and Civilizations". 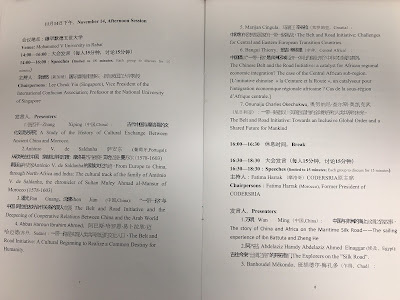 But over all to find old friends, such as Professors Zhang Xiping (Beijing International Foreign Studies University) or Lee Cheuk Yin (National University of Singapore). And, also, it have served to find new ones like Antonio Vasconcelos de Saldanha (University of Macau), Meron Medzini (Hebrew University of Jerusalem), Oyetola O. Oniwide (Legacy University of Gambia), Marijan Cingula (Zageb University), Josephus Moses Gray (University of Liberia) and Patrizia Zagnoli (University of Florence). And all this, under the warm welcome given us by the management team of Faculty of Law, Economics and Social Sciences-Sale, represented in the persons of their dean Hammes Khailid, their vice-dean Mustapha Machrafi and Fahd El Anmari. The congress was inaugurated with the presence of: Li Li, Ambassador of China in Morocco; Teng Wensheng, President of the International Confucian Association, Pang Guang Ambassador of the UNAOC (Alliance of Civilizations) and Director of the Shanghai Cooperation Organization and BR (Belt and Road) Studies Center in Shanghai, Abdekhakim Benchemach, President of the House of Conciliors of the Parliament of Morocco; Abedelhanine Belhaj, President of Mohammed V University in Rabat. All of them addressed some words to the audience. The obligatory exchange of "presents". China offers beautiful calligraphy with the teachings of Confucius. And Morocco corresponds with Ibn Battuta's book on travel. 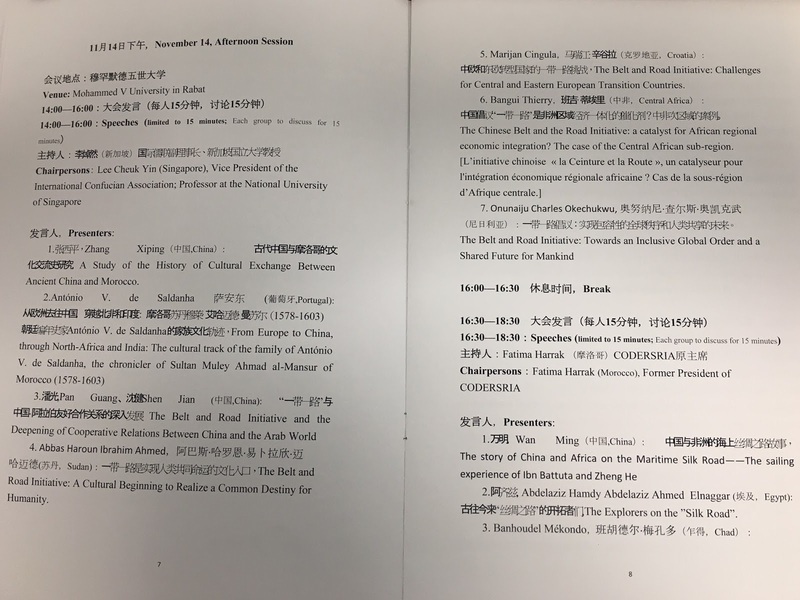 The Congress was divided into five sessions. First Session of the Conferences. Thanks to Professor Zhang I share space with Fatima Farrah, Former President of the Council for Development of Social Science Research in Africa and with Salem Labiadh, former Minister of Education of the Tunisian government of Ali Larayedh, after the "revolution" (Jasmine Revolution or the Intifada of Sidi Bouzid). In the following image you can check all the participants in the session. 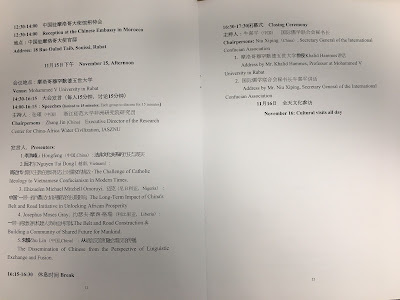 Second Session, with the speak of Zhang Xiping and Antonio Saldanha, friends and real professors of Sinology and China Studies. Third Session with Gilles Ferréol (Franche-Comté University) and Abdelaziz Hamdy Abdelaziz Ahmed Elnaggar (Egypt). 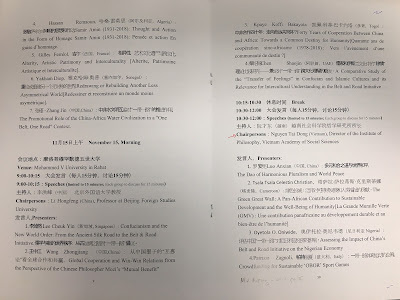 Fourth Session with my friend Oyetola Oniwide and Niu Xiping Secretary General of the ICA. Fifth Session with my friend, the liberian Josephus Moses Gray; Ehizuelen Michael, Zhu Lin and Nguyen Tai Dong. In the following images you can see the rest of the sessions with their correspondent presentations. 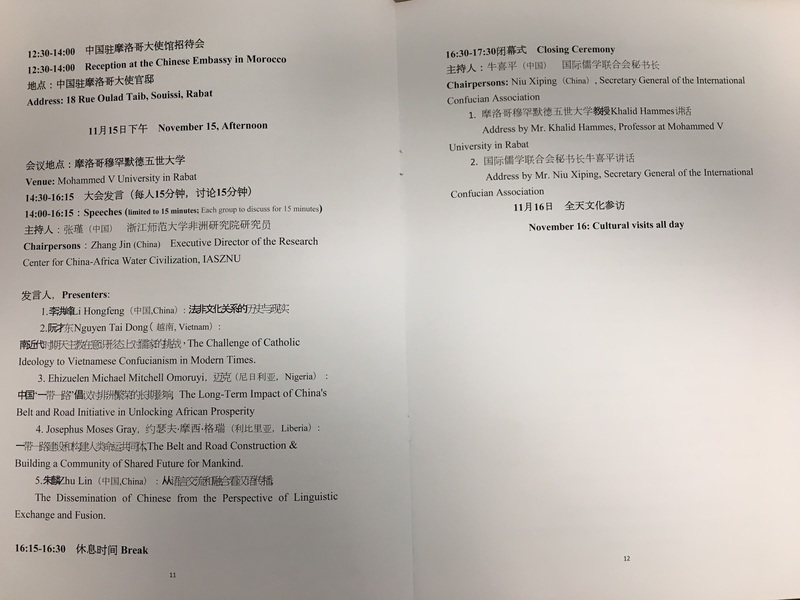 Thanks to the organization, both its Chinese and Moroccan representatives.